The Van Ben Seawater Desalinization Kit is a handheld kit that can treat seawater and transform it into drinkable water. The kit contains a plastic bag that the user fills with seawater. By adding one of the kit’s eight chemical bars to the bag, the process of desalting the water begins. It takes about 60 minutes to make one pint of drinkable water. The chemical bars react with the salt in the water removing it from solution. When water passes through the spout at the bottom of the bag, a filter keeps the salt from passing through, giving the user salt-free drinking water. 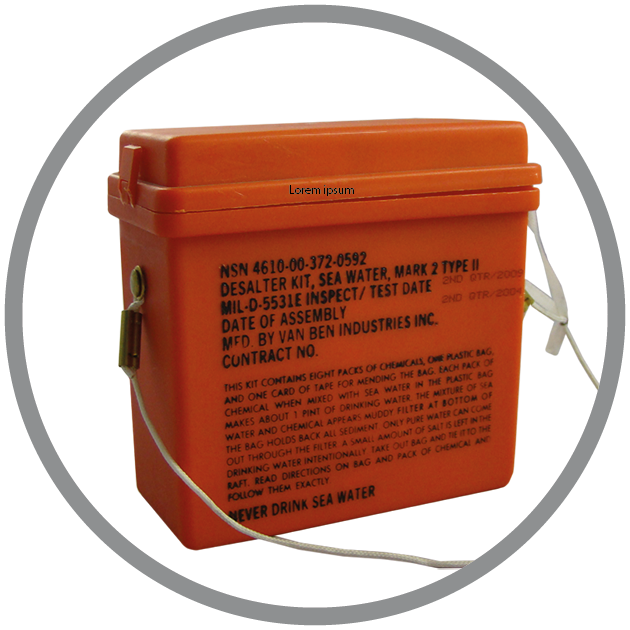 The Van Ben Seawater Desalinization Kit can be purchased individually, or in a case of ten kits. The kit also includes mending tape in case the bag tears. The kit container is made out of heavy, molded plastic. In the event the bag is unusable, the kit container may be used to desalt the seawater as well.